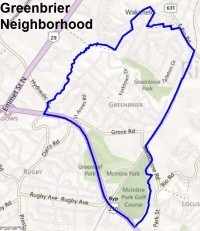 The Greenbrier Neighborhood consists of nearly 650 acres of area located in the extreme northern section of Charlottesville. The boundaries of the neighborhood are the 250 Bypass, Brandywine Drive, Rio Road and the Albemarle County border. The neighborhood was originally located in Albemarle County but Charlottesville annexed the land in 1964. 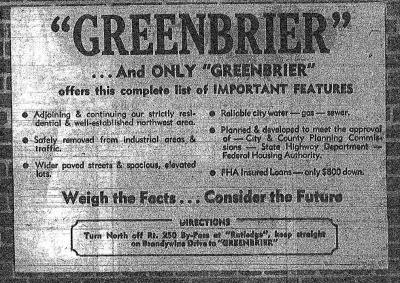 An advertisement in the January 10, 1959 Daily Progress described "desirable homes" with a price range between $15,500 and $28,000. Home sites were available for $3,000. ↑ Web. Neighborhoods: Greenbrier, Charlottesville Community Design Center, retrieved September 1, 2011. ↑ Web. City-county school funding saga continues, Matt Deegan, C-VILLE Weekly, Portico Publications, January 17, 2012, retrieved January 17, 2012. Print. January 17, 2012 page 24.03. This page was last edited on 26 January 2017, at 16:02.